The Forerunner 35 is a worthy introduction to the Garmin family of GPS watches and ecosystem. 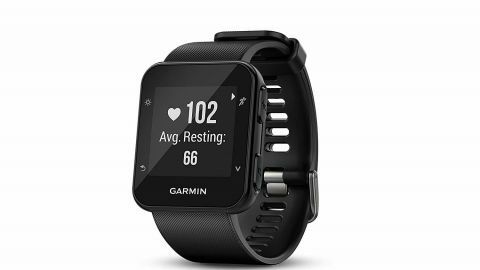 It gives full access to the Garmin Connect software, has smart notifications and 24 hour activity tracking. The Forerunner 35 is for the beginner runner that wants a simple, cheap tool to track their running training without many bells ad whistles. The Garmin Forerunner 35 might not be a looker, but it does offer a solid all round running watch experience. It covers the basics well and is easy to get out running with. If you put in the time, there are plenty of other modes and settings lurking around the software and the hardware that runners and smartwatch fans will appreciate as well. Does in work indoors on the treadmill? Yes it does. When you track indoor running it turns the GPS off and gets the data from the internal accelerometer. The Forerunner 35 is a one-size-fits-all watch. It has an adjustable, stretchy band with several holes that allow it to work well for any wrist size, large or small. Some testers with smaller wrists thought it looked a little chunky because of the relative face size, but they said it fit well and was comfortable.